Born on 27th January 2012 by elective C-Section. Before I get to the ‘birth’ bit I think I should start with a little about my pregnancy. As we’d had IVF we knew there was a risk of twins. At 7 weeks we had our first scan. I can’t begin to explain how excited we were when they found not one but two little beating hearts. We felt so incredibly lucky and never experienced any of the ‘twin’ shock that people often talk about. As an older mum pregnant with twins and with a history of miscarriages I was under consultant and hospital care throughout my pregnancy. On the whole I think the pregnancy was pretty good by twins standards but looking back on it we did have a few scares and problems along the way. This included a couple of early bleeds and an elevated heart rate issue with a possible leaking heart valve at about 6 months. The bleeds proved to be nothing serious and after some ECGs they concluded that whilst my heart was behaving a little strangely it was curious rather than dangerous. We also had a scare at an ultrasound at 30 weeks when they felt there was a problem with one of the twin’s lung development. This meant a few worrying days and a detailed scan at St Georges Fetal Medicine Unit. Fortunately the experts could not find anything worrying and sent us home smiling with some cute 3D shots of twin 1. At this point we also suspected that one of the twins was a boy due to the wry smiles of the doctor when we said we didn’t know the babies’ genders. At 32 weeks I stopped work and shortly after that we moved in to my elder sister’s house as we were in due to start an extension on our cottage. We were scheduled for an elective C-section at 38 weeks. This was because I felt nervous about giving birth naturally especially if I managed to deliver the first twin and then had to have a C-section for the second! 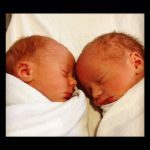 At 36 weeks I was in the ante natal clinic for a routine scan to check on the twins’ development. My blood pressure had started to rise so they asked me to stay in for a few hours to monitor it more closely. By early afternoon I was allowed to go home and said goodbye to my husband Alan as he headed off to North London to work. Once home I sat down to have a nice cup of tea and put my feet up. Then I felt a strange pop and suddenly there was fluid running down my legs. I looked down and the fluid was pinky red. That didn’t seem normal so I started to panic a little and called my sister who lived 5 mins away. She called an ambulance and came straight over. Stupidly I hadn’t quite finished packing my bag to take to hospital as I thought I had plenty of time. The ambulance arrived and whisked me off to Kingston Hospital. It was about 5.00pm when I was admitted to the labour ward and the midwife put heart rate monitors on my tummy to assess the babies. They quickly reassured me that both babies were fine. Twin 1 was head down and ready and twin 2 was breach. Alan then arrived and so I felt more relaxed with both him and my sister there. At this point I started having contractions. It was late afternoon on a Friday and consequently only one operating theatre was open. The midwife said I would probably be taken in to theatre soon but might need to wait if emergency C-sections were needed for others. In the end I did wait, in fact I waited nearly 5 hours as emergencies kept coming. By this time I was having strong and frequent contractions with only gas and air to assist with the pain. I regretted that I had not listened more carefully during NCT classes to the bits about breathing techniques. I’d always assumed I’d have a planned C-section so I didn’t need to know much about coping with labour pains. My sister managed to keep me calm but I was beginning to find the pain harder to tolerate. Finally, close to 11pm they took me in to theatre and gave me a spinal block. That was amazing. We’d been warned there would be a large medical team in theatre so that didn’t worry us to see so many faces. It all happened fairly quickly after that and within minutes Charlie was born, followed by Alex one minute later. Alan cut their cords and watched them get cleaned up. The babies were in good shape, despite being born early their lungs were fine and they didn’t need any special attention. I was pretty exhausted by then as it had been a very long day. In the end the birth wasn’t quite the movie story one I had wanted. It wasn’t the calm and planned C-section I had expected with our chosen music and following our birth plan. However, in reality I didn’t really care as they arrived perfect and healthy and we were just so happy to meet these gorgeous little boys. We were also so surprised that we had 2 boys as we’d been convinced that twin 2 was a girl! From theatre I then went to the High Dependency Unit to recover before going on to the post natal ward. I got a bad case of the shakes which can happen when you get a spinal block. I was shaking so violently I couldn’t safely hold the babies for about an hour. This certainly had some comedy value at the time. Some hours later they moved us all to a 4 bed ward and I managed to doze a little. The next day some of my family came to visit which made it all seem real. We were then moved to a single room which was fantastic. In total we spent 5 days in hospital as my blood pressure was still a touch high and they wanted to ensure we were all well enough to go home. Also the boys had a little trouble maintaining their temperature to start with. Unfortunately I developed some weird allergic rash from either the blood pressure tablets or the surgical stockings. The upside of the rather irritating rash was that it rather wonderfully took my mind off my C-section. At the time Kingston Hospital operated a policy that partners could not stay overnight so Alan had to leave each evening and return at 7am. The nursing team and midwives did assist me during the night but I remember finding those nights very long and being desperate for Alan to show up in the morning. Breast feeding turned out to be a bit tricky but a few of the midwives were very kind and patient and took the time to teach me different holding positions. A particularly lovely midwife was a twin mum herself and so it was so easy to talk to her. We’d always planned to do combination feeding so the boys were getting bottles but finally after about 4 days my milk started to come in. We had to feed the boys every 3 hours because they were small so the days were quite busy just feeding and changing them. Charlie was a particularly slow feeder and took ages to finish his bottle often falling asleep part way through. Overall the hospital care was very good and we were very grateful for all their support in those early days. We left hospital towards the end of a very cold February day and our little babies looked so tiny in their car seats. Hospital had felt very safe and it was a bit of a shock to be driving them home and being fully in charge of these adorable but tiny babies. Our first night home was tough as the babies didn’t seem to want to sleep at all in their new home and didn’t like our new feeding bottles. A midwife visited us every day for the first week or so which was really great especially as it was winter and venturing out seemed a big deal to start with. In total Alan took 3 weeks off. This was a really special time for him as he got to know the babies so well and it was essential for me to have his 24/7 support. I cried that first morning when he left to go back to work especially because his commute was 2 hours each way. We were lucky enough to be living with family at this time so there was often help from my sister and brother in law and without that I think it would have been way harder to manage. It was remarkable how quickly I recovered from the surgery and I don’t remember much inconvenience from the C-section apart from not being able to drive for 6 weeks. I’ll always remember those first few months as being tough but it is incredible how fast you adapt to the challenge and learn how to look after your babies. Those gorgeous tiny babies are now four and starting school in September and I can but wonder how the time flew by so fast.